Howlin' Wolf Records: SIX STRINGS: ATM...Should have stayed a romantic comedy. ATM...Should have stayed a romantic comedy. ATM is a simple story with a very interesting premise. 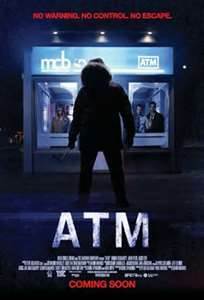 This kind-of-sort-of horror movie is about a faceless heavy coat wearing killer who traps three young people in a ATM booth in the freezing cold. If the three try to leave he tries to kill them but if they don't try to escape they freeze to death in the ever dropping temperature. It kind of reminds me of the movie FROZEN only at a lower elevation and only if I had actually watched FROZEN. I guess that is the killer's way of murder. He traps them and forces them to make drastic decisions on how they will escape and when they try he kills them. Apparently the killer is some kind of jerk with too much time on his hands planning and mapping the view range of nearby surveillance cameras and where he can stand and not get seen at isolated ATM booths. Sounds like a smart movie right? It would be smart if I didn't have the time to think of all the incredible coincidences that occur in the film. Unfortunately for ATM, like the killer, I'm a jerk that has way too much time on my hands too. Now ATM starts off strong with our leading man clumsily trying to get the nerve up to ask a girl out on a date. He has a friend who is a little outspoken pushing him to make the move. The girl too likes our hero and the two start up a short lived romance. What we have here is a movie that could have easily been a romantic comedy that would have been very entertaining. ATM has interesting characters that are well acted. The film is well directed drawing the viewer in with some great shots and scenes never throwing out fake scares to remind the audience that this is a horror movie. You get a good vibe from the cast and they are like friends to you. Then the three friends get in a car and decide to go to an ATM machine in the middle of the night after leaving a corporate Christmas party. Then the bad horror movie stuff happens and the movie loses it's way. Click here to ready my spoiler heavy review. I'd heard this one blew it. Talk about a movie made on a budget. "Hey let's just film this at night so we don't have to spend much on lights, and use the set of an ATM machine." Gotta love horror. It's the cheapest thing to make. Robert Feigenblatt... Rest In Peace. MIND'S EYE! What could this be, you wonder. THE LAST STAND....A very violent car commercial? La-La Land Records... Doubles Your Score! Echo Bridge Entertainment: Saves the Day! Monstrous Movie Music: Mighty Joe Young and More! Monstrous Movie Music: Drive In Special! !